Unsurprisingly, I’m late for Valentine’s Day, but I had to do a Valentine’s Day gown for two reasons. One, Valentine’s Day is the perfect occasion for the type of ridiculousness I do best. Although I appreciate the simplicity of the re-branded Valentine’s Day, I’m having none of it. (Pass the lace.) Two, I love all of you for not forgetting me like I so richly deserve. I’m sorry. The truth is, for the last few months I’ve been devoting myself to my other great interest, which is studying Japanese, and for some reason, when I’m really devoting myself to one thing, my interest in everything else is non-existent, and I am lucky if I can start work on time and make dinner in a consistent fashion. I really miss drawing, though. I’m going to take a stab at doing both. As a matter of fact, I was thinking, if I could combine my Japanese studies and my paperdolls somehow, I would never get tired of either of them! I’m seriously open to suggestions on this point. If you were me, what would you do with these two incongruous, underdeveloped skills? yay!!! you’re back! hurray hurray yay welcome back liana!! This is beautiful!! Absolutely love it!! Glad your back!!!!! Hey! Great to see you back! The dress is awesome! Delighted to see you back – my inner 6-year-old was pleading for more pretty dresses. You should be encouraged that you were so dearly missed! Yayyyyyyyyyyyyyyyyyy Your back! And its something that’s going to occupy me even more and so beautiful! We missed you. Maybe you could do a series of geisha or kimono? I know I’d love that, Japanese culture is one of my big interests right now. That’s beautiful! Yes, I love lace…. I agree with Colleen and Sami about making Japanese costumes- good idea. I’m also studying Japanese at the moment! I suggest you draw some awesome Harajuku-inspired oufits! Hurray! Welcome back! We love you! You could do a Japanese girl paper doll- with traditional, modern, and anime-ish outfits? I loved your Naruto paper doll costumes… and Harajuku would be fun, Dani! Good one! Good luck with your Japanese- I’m working on mine, too. I don’t know how fluent you are, but you could write your description in Japanese with an English translation. That way you get practice with the language and with drawing! ABSOLUELELY AGREE MAKE KAMONOS ETC. Hi Liana! I know quite precisely how shifting passions act – we’ll be here when you’re back! Hooray for the return of Liana! You have been sorely missed. Why not do a Japanese woman and history of her dress? You can teach us a phrase or too. How much would I love that!?! I have been watching your progress over the past year and I am quite pleased with your work. I am only 17, but I do enjoy seeing someone’s work come into play with what I have in mind. As for the Japanese and paperdoll dresses mix, one idea you could use is to keep your original designs, but have some Japanese script going down the dress or however you see fit. You could also do the kimono idea someone mentioned above with your usual flare, but I would study on the different types of kimono so that some idiot doesn’t fuss you out for ignorance. I know that there are different types, but other then that, I do not clam to know much else. I do like the flaming dress you did a year ago, and if I was skilled in weaving fine cloth, I would make it for you. It would fit my sister personality perfectly, as she could get firey at times. Welcome back and and thanks for coming back and I LOVE THE DRESS!!!! *crosses fingers and screws eyes shut while whispering* harajuku, harajuku, harajuku! *blinks* You must have the patience of a sloth! Dani, you are super funny! That made me laugh out loud! Can I use your doll as an example to make my own paperdoll? I want to make my own paperdoll blog, but I’m not sure how to draw the feet so can I copy Sylvia’s feet? It it beautiful! What about a japanese inspired dress? Kimono? Probably totally butchered the spelling! So excited Thankyou for the new dress! Hi Liana! I love your paper doll blog! I really look forward to looking at all the beautiful gowns! I think it’s great that your learning Japanese! I have a request. I have read the book the little white hose and I love it! The movie is called the Secret of Moonacre Manor. Possibly could you do a gown from the movie (Although just a warning the movie is not like the book)? 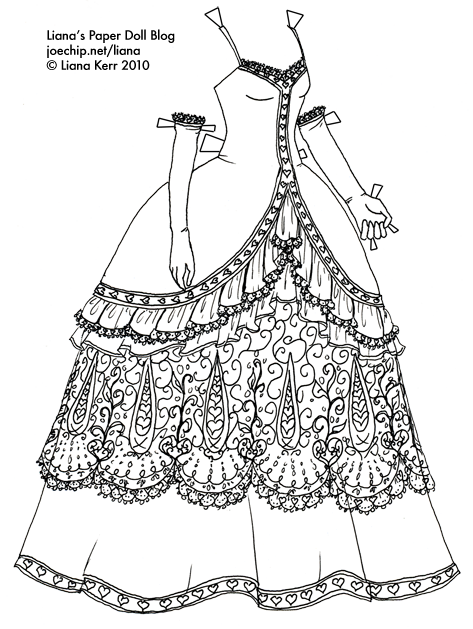 Are you going to make a March birthday dress. I had my birthday last week. Really wish you would post again. Love everything. You could do dresses and/or dolls that were Japanese. This way you could still draw. The dolls and dresses would have a asian flair. Ok. When I first saw this blog I was like…paper dolls I’m wayyyy too old for that but wow. WOW. I seriously hope you are avaible for hire because I would seriously hire you as a personal costume designer…AND you can write stories…well my comment is that YOU SERIOUSLY ROCK. Oh and btw japanese kimonos are awesome. You should do one. I said seriously too many times didn’t I? Hello Liana! I’m so excited about your return, but I have two questions for you. Firstly, will you design a bodice for the gown which you drew on November 21st, 2004 entitled “And if the mountains should crumble”? I know you said it would be impossible to return to your old blog but I really wish to make that dress and when I meet Mr Right, wear it as a wedding gown. Secondly, when you do return to us, could you make a birthday dress for November? It’s mu mum’s birth month and you haven’t yet drawn one on this blog. Liana, I sincerely hope that you find a way to keep paperdolling. If you wish to incorporate more Japanese influence into your drawing how about simply watching the “gaijin free” godzilla movie again for some inspiration or re-reading the Tale of Genji, only if you’ve still got it lying about the house, of course. I like Saetbyull’s idea though. I miss you, but your drawings are honestly the most inspirational and moving things I have ever seen. i love your paper doll dresses!! Hi Liana! I just found this website today and I’ve spent 4 hours just looking at all your beautiful clothes! I can’t wait until you post something new! Hi Liana! I discover your web site and it’s amazing. My daughter will be so delighted. Thank you so much and congratulations from France for your creativity! My birthday is this week and I’m hoping you’ll do an April/spring dress. Even if you don’t decide to do that, please start posting again! I used to check your blog every day and I miss having the dresses to look forward to!!! Its great you are back, keep on drawing because you are so good at it! I have followed this blog for about 3 years and have never commented before. So here it goes, you are a wonderful artist and your work always very well done and creative. I have really enjoyed this blog. The dress is lovely, it was nice to hear from you again. =) If you need any ideas for new outfits I would suggest the costumes from the new Alice in Wonderland. Great movie, awesome costumes, and i think you’d have fun drawing them. Hope to hear from you again soon! If you need inspiration for a dress or two, check out the costumes for Return to Halloweentown. Some of the dresses are really nice! Please make another dress!!!!!!!!!!!! please!!!!!!! were have you gone! its been 2 months! come back liana! Liana! I am most displeased by your continued absence. We need pretty dresses! Please come back to us! I miss seeing new dresses every day! Please come back soon! I have a question. Did you ever think of makeing a mermaid paper doll? It would be cool to try an all fairytale based set of ensembles. try Peter Pan or Alice in Wonderland. You’d make the characters jealous! Lianaaaaaa if you’re not coming back can you at least pleaaaase do a post telling us? So we don’t continue to hope? i want a birthday dress!!!!!! :( my birthday is in two weeks! !